If you go to the average house and look in the garage you are probably going to see that at the very least it is not well organized. The worse garages will far exceed this and be a total mess where it’s nearly impossible to walk in them. Garages like this are all too common, and in many cases, the mess gets so bad that people can’t even park their car in them. If this sounds like your situation then you have one of two choices you can make. You can either live with it and have a disaster area for a garage, or you can install garage cabinets and transform the mess into an organized storage area and workspace. Garages often become the dumping ground for a house. How often have you just thrown something in the garage intending to put it away later? But later doesn’t always come, and then before you know it you have a huge mess instead of a garage. Now you may not even be able to park your car in your garage. What happens when you need something from your garage? Well, you are probably in for a lot of time spent digging and searching for what you need. If your garage is bad enough you might even decide to give up and just go out and buy another one of whatever it is rather than waste more time digging through the mess. Home improvement projects can be a lot of work, but they can also be very worthwhile for a number of reasons. Obviously, the first advantage that doing something like installing garage cabinets is that it’s going to allow you to make better use of the space in your home. But what you may not realize is that a well-done home improvement project, like installing garage cabinets, can actually add a lot of value to your home. So do the projects that make the most difference. 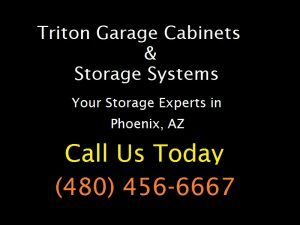 One of them is to get custom garage cabinets installed in Phoenix.